Edward Clydesdale Thomson and Sjoerd Westbroek. It has arisen out of a continuous and ongoing discussion, driven by a shared interest in questions of artistic responsibility, the role of images and uses of technology in art, amongst other subjects. The exhibition is an attempt to give form to these discussions and in particular to pay tribute to several creative practitioners whose work has helped shape the basis of the dialogue. For the week leading up to the presentation the three artists will work together in the exhibition space, creating a print workshop from which they plan to produce a series of posters for display. Their aim is to consider how the production of a poster can be employed as a form which aspires to speak without necessarily offering a resolved argument. 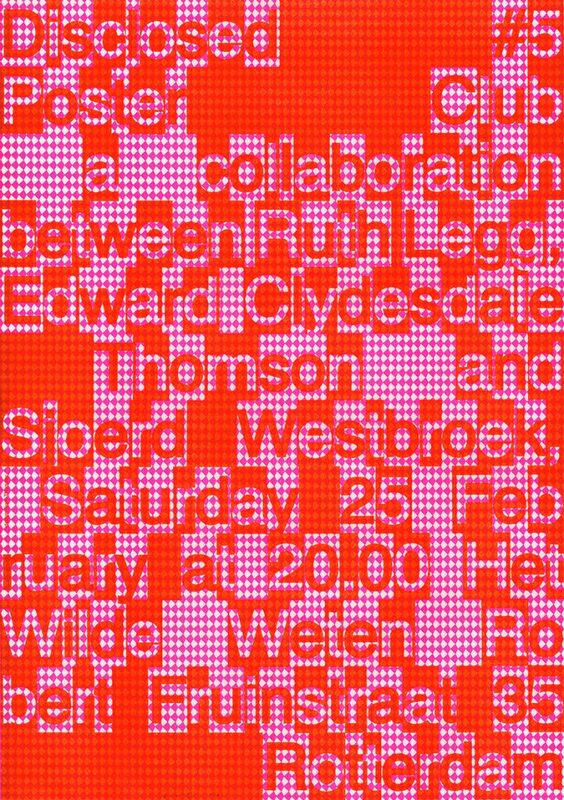 Poster Club is part of the public program DISCLOSED initiated by the members of Het Wilde Weten. Every six weeks one of the members will host a public event that derives directly from their artistic practice. This will result in a lively series of talks, exhibitions, screenings, performances and more, disclosing the energy and pluriformity of the collective and creating public moments to meet and interact.